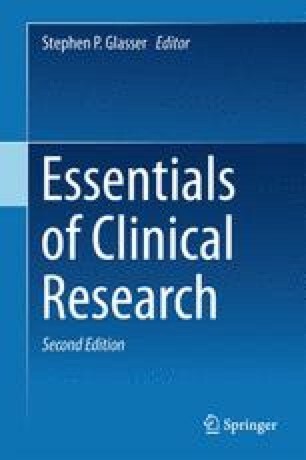 There are four general reasons for clinical improvement in a patient’s condition: (1) natural history of the disease; (2) specific effects of the treatment; (3) regression to the mean; and (4) nonspecific effects of the treatment that are attributable to factors other than the specific active components. The latter effect is included under the heading ‘placebo effect’. In this chapter the placebo effect will be discussed, with some emphasis on regression to the mean. Placebos (‘I will please’) and their lesser known counterpart’s nocebo’s (I will harm’) are sham treatments. The difference is in the response to the inert therapy. A beneficial response to an inert substance is a placebo response; a side effect to an inert substance is a nocebo response. If a placebo were submitted to the FDA for approval, they would no doubt be impressed with its efficacy, but would probably not approve it due to its frequent side effects. Effects morbidity of treatment on in hypertension II. Results in patients with diastolic blood pressure averaging 90 through 114 mm Hg. JAMA. 1970;213(7):1143–52. doi: 10.1001/jama.1970.03170330025003.